February 15-24. Fridays and Saturdays at 7:30 PM. Sundays at 2:00 PM. At TRINITY CENTRE. 407 W. Fifth St.
Tickets are $20.00 for adults, $18.00 for students (plus tax). There will be a $2.00 surcharge for all tickets purchased at the door. 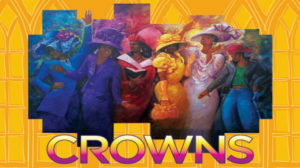 CROWNS is directed by McCellus Mays. The band is sponsored by ALIGN WEALTH MANAGEMENT, a practice of AMERIPRISE FINANCIAL.